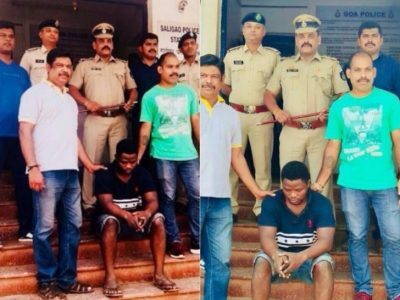 Calangute Police in North Goa, India have arrested one Nigerian National for allegedly drugs worth Rs 1.5 lakh. According to Calangute Police Station In-charge Police Inspector Jiva Dalvi, information was received about a Nigerian National coming to deliver a consignment of drugs at Porbowado, Calangute, Bardez-Goa. Immediately a team was formed to conduct a raid and Mr Dalvi along with the team left to trace the accused person in private vehicles. Accordin to Webindia, the Nigerian man was noticed near a restaurant on a scooter and when told to stop he attempted to flee from the spot. Police chased him at a distance and he was subsequently over powered and apprehended. Upon questioning the Nigerian National identified as Joe Nnama Enzema (31) admitted of being in possession of drugs. During the personal, search Ganja worth Rs 30,000 and Charas worth Rs 1,20,000 was found in possession of the the accused which was attached under search and seizure panchnama. Police also attached one scooter bearing which was being used by the Nigerian National. The raid went on from 2200 hrs to 2400 hrs on March 25. The accused was placed under arrest under sections 20(b)(ii)(A) of NDPS Act. The raiding team consisted of PSI Rushikesh Patil, PSI Sitaram Malik, police constables Dinesh Morajkar, Govind Shirodkar, Vallabh Pednekar and Vinod Kerkar. The accused Nigerian was to be produced for remand on Monday. Further investigation was in progress under supervision of SDPO, Porvorim, Kiran Padwal and SP North Chandan Chawdary, Mr Dalvi said. The Calangute Police in India also arrested a businessman from Taleigao for alleged illegal possession of narcotic substance worth Rs 55,000. Panaji police said they had information that the accused, Santosh Majumdar, 41, a resident of Taleigao, has been buying drugs from Vasco and selling it to people in Taleigao. Acting on a tip-off that Majumdar was coming to Taleigao to deliver drugs to a buyer, a police team, under PSI Rashmi Bhaidkar, caught him red-handed.